> Which conditions do we treat? The most important thing is not what your operation is, but who performs it. Thyroid cancer comprises a group of four different types of cancer, of which the most common is Papillary Thyroid Carcinoma. Between 5 and 15% of thyroid nodules are potentially malignant. This cancer has one of the longest survival rates. Papillary Carcinoma: It represents 80-85% of the total of thyroid cancers. It grows very slowly. It is more prevalent in children and women of menstrual age. It is related to head and neck radiation exposure. Its extension is essentially local and lymphatic in the neck ganglia. Follicular carcinoma: It represents 5% of the total of thyroid cancers. It grows very slowly. It is more frequent in menopausal women and in populations living far from the sea and with diets low in iodine. Its extension is fundamentally sanguine, mainly to the skeleton and to the lungs. Medullary carcinoma: It represents 5-8% of the total of thyroid cancers. 25% have hereditary transmission. Its extension is fundamentally sanguine. Anaplastic carcinoma: Very infrequent, <1% of cases. It grows quickly and has a very aggressive behaviour. More frequent in older people. Its causes are unknown. Up to 15% of thyroid gland nodules can be malignant. Goiter is a swelling of the thyroid gland in the form of a tumour in the front part of the neck. Sometimes this growth is invisible because it occurs inside the thorax. Usually, thyroid hormone levels are normal and do not give any symptoms until the thyroid gland is significantly bigger. 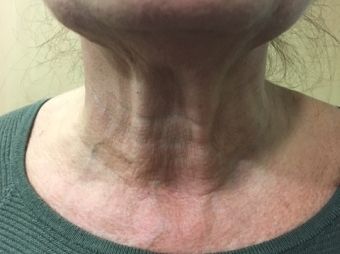 It can cause respiratory distress (due to deviation of the trachea), especially when stretching in bed; nervous entrapment with irritative cough, changes in voice or aphonia and esophageal compression with discomfort and difficulty in swallowing solid foods or choking when ingesting liquids. 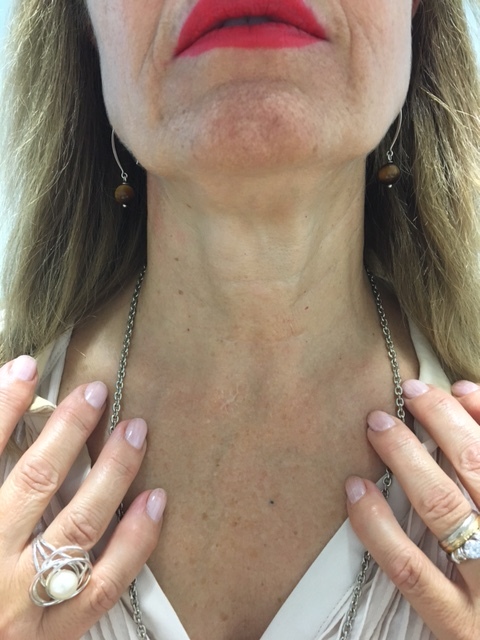 We must be aware that thyroid nodules larger than 3 cm should be removed, due to the compression they may cause and the risk of degeneration in thyroid cancer. 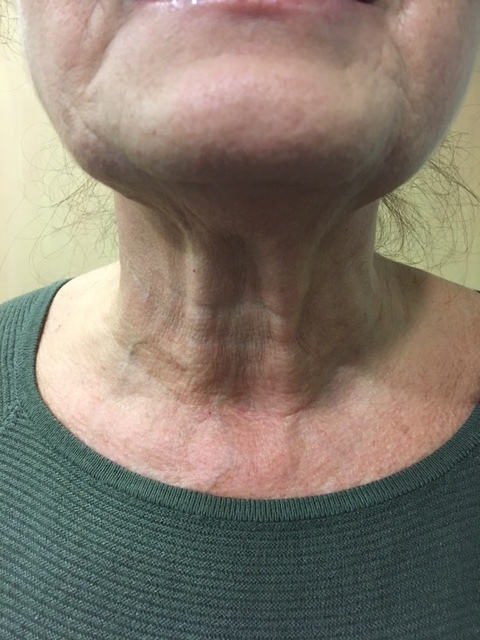 Multinodular Goiter can manifest itself by difficulty in swallowing, choking, coughing, changes in the voice or aphonia, as well as in respiratory difficulty, especially when stretching. A thyroid cyst is an accumulation of fluid, which forms a pocket inside the thyroid. Most of these cysts are benign, although a small proportion can grow and cause significant discomfort. For this reason they must be analysed. The usual treatment for a thyroid cyst is the aspiration of its content. However, in some cases, it is necessary to operate. Most of these cysts are benign, although a small proportion can grow and cause significant discomfort. For this reason they must be analysed. A hernia is a protrusion of the contents of the abdominal cavity through the inguinal canal or another area such as the navel. When the inner layers of the muscles weaken, it appears as a bulge. Hernias can appear in the inguinal region and also in other locations such as the navel or the lateral area of the abdomen. Generally speaking, it is easy to recognise a hernia. You may notice an inflammation under the skin. You may feel pain when lifting heavy objects, coughing, or using force to urinate or defecate. They occur very frequently and their repair is one of the most habitual surgical procedures. A hernia does not improve over time, nor does it go away on its own. It can only worsen and impair the patient's quality of life, decreasing their mobility and independence. A hernia does not improve over time, nor does it go away on its own. It can impair the patient's quality of life, decreasing their mobility and independence. A thyroid nodule is an abnormal growth of thyroid cells, which form a tumour inside the thyroid. The great majority of these nodules are benign. Nonetheless, unfortunately a small proportion are malignant and for this reason it is necessary to study them all. Usually a partial thyroid excision is sufficient to treat a thyroid nodule. The great majority of these nodules are benign. Unfortunately, however, a small proportion are malignant and for this reason it is necessary to analyse them all. 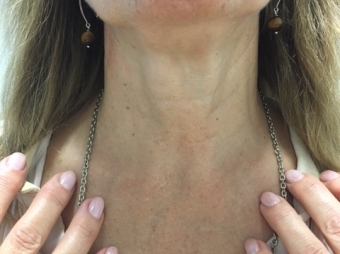 Hyperthyroidism is the term used to define the hyperactivity of the thyroid gland tissue, when an excess of circulating free thyroid hormones is produced: thyroxine (T4), Triodothyronine (T3), or both. These hormones are important at the cellular level and affect all the tissues of the body. When it occurs acutely, it is called thyrotoxicosis. The main function of thyroid hormone is the stimulation of metabolism and is essential for the normal function of cells. In excess, the metabolism is over-stimulated causing an "acceleration" of various systems of our body and resulting in symptoms similar to an overdose of adrenaline. These include rapid heartbeat and the appearance of palpitations, tremors and symptoms of anxiety. Diarrhea and weight loss can also appear. Hyperthyroidism produces tachyarrhythmias and palpitations, tremors and symptoms of anxiety. Diarrhea and weight loss can also occur. Hyperparathyroidism is the hyperfunction of the parathyroid glands that leads to an excessive production of parathyroid hormone PTH. Normally, this hormone excess is usually produced by a tumour or a growth of the glands as a whole. This causes the bones to decalcify and calcium to circulate through the blood in excess. When this happens, it is called a Primary Hyperparathyroidism (HPTP). The symptoms that patients may suffer include headaches, irritability, osteoarticular pain, high blood pressure, osteoporosis, or even nephritic colics. As many of the patients are women, these symptoms are often wrongly attributed to menopause. The most frequent symptoms of hyperparathyroidism are osteoarticular pain, irritability, headaches, osteoporosis, high blood pressure, and even nephritic colics. The adrenal can stop functioning properly. There is a type of pathology that does not produce detectable hormonal alteration and therefore it can be difficult to diagnose, these would be non-producing tumours (adenoma, myelolipoma ...). Usually this condition does not show any recognisable or specific symptoms, although patients may suffer from abdominal pain and discomfort or symptoms due to the compression of another organ. Adrenal tumours are usually diagnosed incidentally (they are found when looking for another disease). Another type of pathology is when a hormonal alteration ocurrs (defect or excess), such as adenoma, pheochromocytoma, Cushing's syndrome, etc. The diagnosis is made through the study of these recognisable symptoms which are produced by the excess or deficit of the specific hormone. It is necessary to remove the gland in the majority of benign non-functioning tumors of> 4 cm, and always in all benign functioning tumors (Conn's syndrome, pheochromocytoma) and cancer. It is also frequent to discover metastases of other tumours that settle in the gland during the follow-up of the neoplastic disease. It is necessary to remove the gland in the majority of non-functional benign tumours over 4 cm, and always in the cases of functional benign tumours or cancer. The gallbladder or cystic vesicle is a non-vital organ that aids digestion and stores the bile produced by the liver. Sometimes gallstones or polyps can develop inside it. If their existence is discovered accidentally with no digestion problems or alterations, it will only be necessary to perform routine controls. At times they can give the patient discomfort or symptoms that are attributed to other diseases. If the gallbladder does not work properly or has stones inside it, it can give easily identifiable symptoms such as: colic pain in the liver region, indigestion, feeling of swelling in the stomach area, diarrhea and so on. If these symptoms are accompanied by nausea, vomiting, pain that does not subside or a fever, it could be a case of chronic colic or even an Acute Cholecystitis (an inflammatory process of the gallbladder). The appearance of colicky pain, nausea, vomiting or fever is a warning that the gallbladder is not functioning properly and should be removed to avoid further complications. If a patient has gallbladder stones, and the appearance of colicky pain, nausea, vomiting or fever is detected, this is a warning that the gallbladder has a problem and should be removed to avoid further complications.